I recently gave my husband a special anniversary present that combined his photos with some of my own. Do you want to see what I gave him and how I did it? 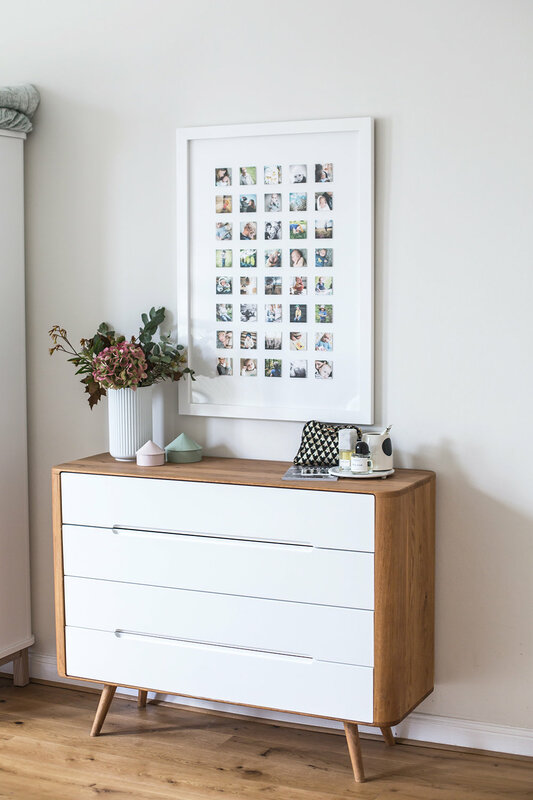 I worked with The Little Square Gallery in England, where you can commission a custom piece using your own photography or child's artwork, to create a very special work of art for your home. Here are some of our photos for the piece. I'll talk more about the process in the moment, but I want to cut straight to when the piece arrived. I was so happy! I had tears of joy running down my face. It was so touching to see our family photos together in a grid of 40 little squares and so beautifully made. From the beautiful frame to the overall quality of the work, I was deeply touched and impressed. My husband loved his gift and my little boy was happy too. From the birth of our son until this year (he's 3 1/2 now), we have made some of the most precious photos of him and included them in this piece. All who visit our home take time to look at each little square and comment on things they like -- a smile, a gesture, a memory, whatever it is that caught their eye. This is a great conversation piece. My little boy loves to look at it frequently too. We've installed the piece in our bedroom above my dresser, as you can see below. This artwork also gives my home a warmer, more cozy feeling because it is so personal. It shares the first three years of my son's life - his birth and toddler years, which I find absolutely the most precious, scary, exciting, nerve-wrecking, emotionally intense time of my entire life. Now that he's older, it's so much less intense (though we are currently potty training him - omg!) but I'll never forget bringing him home and how the things changed immediately upon his arrival. The feeling, the energy, all of it. It was magical and like walking slow motion through your own dream, yet you're awake. I'll never forget the first three years with a new baby. It was surreal and wonderful and just every single emotion you could imagine having, all placed into a capsule of time that you can never relive, get back, change, or even fully remember in the years to come. Luckily, we can take photos and freeze memories and emotions. Yet, most of us have thousands of photos on our computers and phones just taking up space. Get those photos sorted and create a piece of art! Really! Do something with them to take them into your home and show them in a stylish, creative way. For me, saving the first three years of his life in photos, was absolutely essential and why I choose this time period for the commission. Seeing the piece daily is a big reminder of phase in my life that I will always remember with the fondest memories. A child really changes everything and with that, comes great change in yourself and the dynamic of your family overall. I was thinking about something the other day, concerning photos and family. Do you remember when you used to visit your grandparent's house as a child, and you'd roam around looking at all of the framed family photos? They'd be all over the fireplace mantle, on a special "photo table", in a cabinet, and always in the hallway on the walls or along the stairs going up to the second floor. Then, the photo albums. So many! Grandma loved to drag them out and show every single photo. Mine did this so often, but I was the rare kid who happily flipped through those albums mesmerized by all of the people and places that I saw. I remember feeling so warm and connected to my family this way. I saw similarities in facial features, gestures, and even in personal style of some of my family members and me. It was so interesting. Plus, grandma always had good sweets to share as we flipped through her albums. She'd have the candles on, a tray of sweets, some tea out and the television on in the background - usually the evening news or some classic show like I Love Lucy, which back then, was a classic already. You know what? When my grandparents died (a year apart), I went to their home and my mother told me to take what I wanted. I took the photos albums. That's all I took. And I'm so glad that I did because when I'm homesick for my life in America, or want to relive some of my family history, I take them out and spend time with these precious albums. They help connect me to simpler times with my grandmother sitting close by with her hand on mine. Nowadays, when I look through design books and magazines, I don't see anything really personal in most homes. I don't see family photos on the walls so much, I don't feel like I can get a real sense of the people living there because most homes appear to be overly styled, depersonalized, lack intimacy and warmth, and a bit like a boring catalog. I'm personally fighting against this now more than ever in my home. Since having a child, I've decided to bring back some of the earlier feelings I had when I was at the home of my grandparents as a kid. I want Aidan to see his artwork on the fridge (and it always is! ), his photos around our home, greeting cards from friends and postcards posted around the family calendar on the wall (yes, a real calendar, not on my computer! ), and I want our home to feel like there are real people living here and creating memories. This commission was one part of my rebellion against overly-decorated fussy home decor that has plenty of style but no heart. Why can't you have BOTH? The Little Square Gallery worked closely with me to get the piece exactly as I wanted it. I thought to incorporate some seasonal nature photos so that not every photo was with a face. I liked mixing it up and adding in nature shots since we spend so much time with our child outdoors. We had him in the forest on the 7th day of his life in the stroller, with his eyes to the sky looking through the leaves hovering over him. We are with our little boy in the forest nearly each day and on the weekends, in the countryside or mountains taking long walks and hikes. I liked the care and attention of Natalie, the owner of The Little Square Gallery, took in helping me to get the order of the photos right so that visually, the piece was relaxing, pretty and the colors were right. I went through and made sure all of the colors were correct before submitting them, but then she handled final tweaks and all of the cropping. I love her good eye and attention to detail. I have to mention that I'm often a hard person to please when it comes to art and photography - and layout. I am so critical of the layout of most things - rooms, books, websites, art! Maybe you can relate. When Natalie sent me the first draft of the grid layout, I was shocked. There were so few edits on my part. This was a massive relief. I was worried that this piece would take weeks to get right because I'm a hard customer to please. It was refreshing to see that it took her very little time. The piece came delivered to me in Germany from England and upon unboxing, I stood in my dining room in awe. I'll never forget that feeling of being happy to the core over a material possession because in many ways, I've seen it all when it comes to decor - so I'm also not easily impressed. But this piece, it was absolutely touching and now that I've had time to live with it for 3 months, I can honestly say I like it more now than I did when it arrived. It really has a forever spot in our home. Thank you Natalie and Little Squares Gallery for your lovely work on this photography commission! NOTE: Holiday 2017 orders should be placed by 17th November. If you want to win a piece from The Little Square Gallery with 24 Little Squares, visit me on Instagram until November 15th to enter. You can enter beneath the photo showing the above art.